Six Feet Under is an American drama television series created and produced by Alan Ball. It premiered on the premium cable network HBO in the United States on June 3, 2001 and ended on August 21, 2005, spanning five seasons and 63 episodes. The show was produced by Actual Size Films and The Greenblatt/Janollari Studio and was shot on location in Los Angeles and in Hollywood studios. The show depicts members of the Fisher family, who run their funeral home in Los Angeles, and their friends and lovers. The series traces these characters' lives over the course of five years. The ensemble drama stars Peter Krause, Michael C. Hall, Frances Conroy, Lauren Ambrose, Freddy Rodriguez, Mathew St. Patrick and Rachel Griffiths as the show's seven central characters. 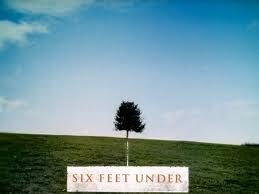 Six Feet Under received widespread critical acclaim, particularly for its writing and acting, and consistently drew high ratings for the HBO network. Six Feet Under has frequently been described by critics as one of the greatest television series of all time as well as having one of the greatest series finales of all time. It won numerous awards, including nine Emmy Awards, three Screen Actors Guild Awards, three Golden Globe Awards, and a Peabody Award. The series' main theme, written by composer Thomas Newman, won a 2002 Emmy Award for Outstanding Main Title Theme Music and two Grammy Awards in 2003 for Best Instrumental Composition and Best Instrumental Arrangement. Thomas Montgomery Newman (born October 20, 1955) is an American composer and conductor, best known for his many film scores. Fabulous show. I greatly enjoyed this theme music as I thought it captured the overall tone of the show and set up the fade into the episode. Thomas Newman is one talented gentleman.